"WORLD TRADE CENTER" WTC III. Oil on canvas 40" X 50" (102cm x 127cm). This work is unique and accompanied by a certificate of authenticity signed by the artist. KULON ;a passionate, forceful painter. Kulon is influencing art through his striking ability to capture emotionalism on canvas. His artwork uniquely captures the spirit and soul of the subject painted. Through communication of color, balance and technique, make his paintings extraordinarily remarkable. While often controversial, his work ranges in style from modern realism with surreal elements. Even his abstracts stay within the bonds of visual credibility no matter how much he modifies. The appearances of persons or things. Kulon holds to the conviction that the direct connection between the artist and the subject. Is the vitalizing element of painting. Kulon was born in Sanok, Poland. And developed his skills in the traditional manner, studying with masters such as Bronislaw Naczas. Edward Kiferling, Marian Kruczek, and Michal Bylina. Today, Kulon lives in the Catskills, not far from New York City. And paints subject matter that moves his sensitive nature. This can result in sublimely executed portraits and landscapes. However, his art often deals with the poverty, cruelty and pathos of human existence which. According to Kulon, has been degraded through social forces beyond individual human control. His paintings have become part of museum, gallery, and private collections. In Europe, Asia, and the United States. 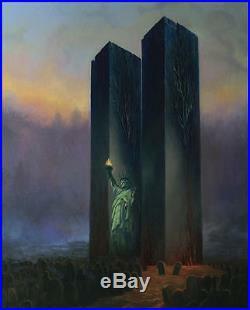 KULON WORLD TRADE CENTER WTC III oil on canvas" is in sale since Wednesday, March 13, 2013. This item is in the category "Art\Paintings". The seller is "***gallery" and is located in Parksville, New York.